N. K. Jemisin proves once again that she's more than up to the task of doing new and amazing things with epic fantasy. The Fifth Season is unmistakably hers—it has the lyricism, the intricate and stunningly visual worldbuilding, the complexity of story and character that we've come to expect from her—but it is entirely new. It is the story of the end of the world. One of many on a far future world where all the continents have merged back into one and the civilization is in decline among the ruins of a hundred other dead and gone civilizations. The whole book is a dance of ends and beginnings. Told from the point of view of three distinct women in three distinct places in the world and slowly converging into a sharp point that leads into the next book, it's the story of Essun, who's husband has just killed her son as the continent cracks in half and forces the world into a survivalist doomsday contingency plan. It's the story of Damaya, who is rescued from her backward home town to train the dangerous powers she's developing before someone thinks to kill her for them, and who finds that the hope offered is also just another sort of control. And it's the story of Syenite, a trained orogene, able to control the movements of the earth, sent on a mission that reveals all the many hidden lies and dangerous edges of the world she's determined to make the most of. Essun heads out of town on foot to find her husband and the daughter he stole from her as the world falls apart, and meets people who will be important almost immediately. Damaya works hard to be the perfect orogene and avoid the pain that comes from not doing her duty, but accidentally discovers that there's a secret hidden in the middle of her enclosed world. And Syenite is given the mission of breeding a new powerful baby with the one man who can expose all the faults in the world they inhabit, while clearing a blockage in a harbor that should have been easy and turns out to be part of a much larger problem. But it's the world they move through that shines through most of the book. The worldbuilding is daring, relentlessly imaginative, and stunningly ambitious—and yet makes perfect sense in the context of the story. There are giant crystals called obelisks that float in the sky, left over from one of the many dead civilizations. There are people called rock-eaters that aren't made of flesh and blood and have mysterious motives. There are people who can control the earth itself and are considered to be agents of evil to be tamed or killed—and a whole world of control and slavery dressed in pretty details to cover up the social and mental chains. There's a society built on survival that is basically a socialist dystopia. There are ruins and geological calamity everywhere. And there's a vast amount of history that is told in snippets and uncovered in world-changing revelations, or sometimes barely hinted at, yet still incredibly deep and rich. The execution of the story is also well handled. Essun's parts are in a perfect second person that flows so smoothly that the tense shifts between her chapters and Damaya's and Syenite's are barely noticeable except where there's a reason to notice them. The three stories take place at different times, during different political and social situations, in different historical and personal contexts, and yet they blend seamlessly and organically as the story unfolds to tell one huge and terrible and beautifully made story. The book starts with a devastatingly personal murder and ends with a world-changing request, and everything in between is fascinating, unexpected, and impressively well-rendered. It's also a stunningly diverse book. People in the book are of all sorts of colors, from all sorts of cultures, and generally it doesn't matter to the jobs they can do or the lives they can lead. They're of many genders and orientations, and it's all accepted and moved-on-from with almost no comment; people simply are what they are. This might be shocking to some, but it isn't created for shock value—it's a future world in a wildly different cultural context that has other concerns as the world is ending, and it's refreshing and daring and makes expanding the genre look easy. And it's not like anything else around. Again. 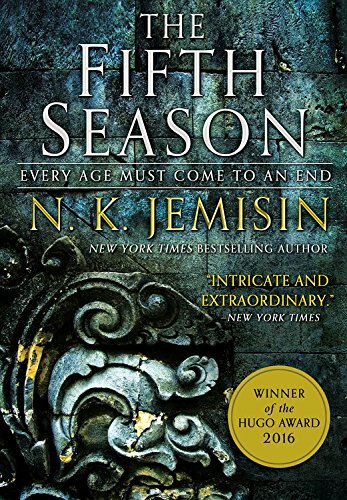 N. K. Jemisin seems to excel in creating new worlds with every book with rich, detailed tapestries of history and culture and change and bizarre but clearly defined artistic ideas, and she's proven again that she's still got it. This is the start of her third series in five years, which is in itself impressive, and she shows no sign of tiring or running out of ideas any time soon. She crafts here a story about secrets and reclaiming choice and choosing truth over the comforting lies that create willful slavery. It's a comment on a history of enslavement without being a story about slavery, and it's a comment on cultural corruption without being a story about corruption. The Fifth Season is a fierce and sometimes brutal story about what drives people to destroy things, but it's also exciting and rich and is told with a surety and balance that makes the strangeness and ambition of the story easy to understand without ever talking down to the reader. N. K. Jemisin proves again that she trusts her readers to be smart and to pay attention, and she gives us a buffet of new ideas and strange and wonderful storytelling in return for living up to that trust. If you're looking for bold, fresh, exciting new work in the epic fantasy genre, this is the book for you. Samantha Holloway is a freelance writer, editor, and novelist. Her epic fantasy novels Wisewoman's Daughter and Sister to the Sun are now available at Amazon, with Goddess's Hand coming in September 2015. Her academic work has appeared in the Essential Science Fiction Television Reader as well as at various conferences.